Crisis on Infinite Earths :: And Hawkwoman? Royally screwed. 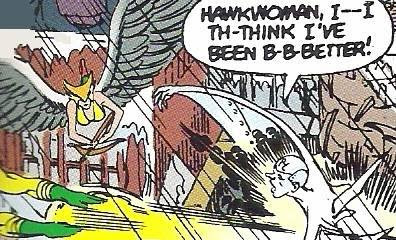 That was Hawkwoman's fate in Crisis on Infinite Earths, and not because any cosmic multiversal Antimonitor-generated destructive wave attacked her; but because she had no participation in the story at all. Her two or three apparitions were so insignificant and minuscule that she could barely be recognized. She only had one line, a very pathetic one. She was fighting some villain along with member of the Metal Men, Tin. Even in the superhuge mural by George Pérez and Alex Ross that was later used as a poster and cover to the collected volume, poor Shayera got shafted. Although it is understandable that not everyone can have the spotlight in a shot with hundreds of characters, you would think that the Justice League members would get some decent exposure... not! 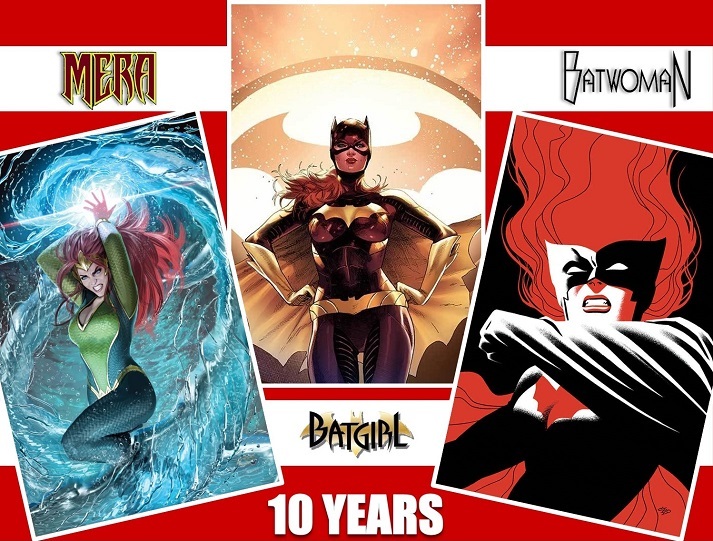 As you can see, Mera and Batgirl are at least recognizable; but Hawkwoman got so relegated to the background that I don't blame you if you cannot find her. Once the dust settled and the Crisis was over, the hardest part came: saying good bye to the fallen in battle. 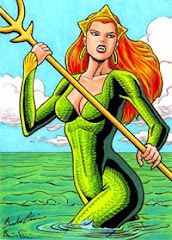 I Atlantis, Mera, along with Aquaman, Aqualad, and the people of Poseidonis, said good bye to Aquagirl and Lori Lemaris, who persihed heroically trying to save others. 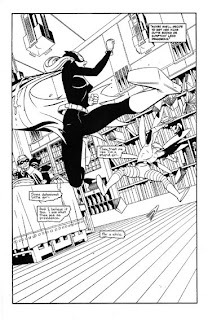 Other casualties of the crisis were Robin and Huntress from Earth-Two and the Titan Kole. They fell victims of the killer sadows. 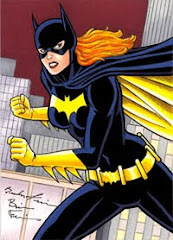 Batgirl, along with Batman, Robin, and Mary Marvel tried to look for their bodies, but they were never found. Crisis on Infinite Earths affected the entire multiverse... billions and billions of lives were extinguished, and the story included hundreds of characters in only twelve issues. 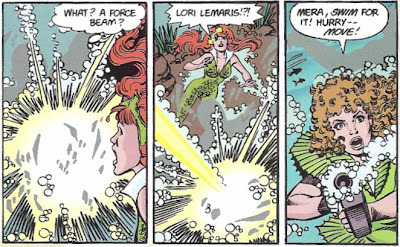 With this in mind, we can say that Mera's participation was somewhat significant in the saga. 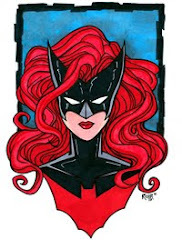 She was part of the team of super heroes who went to Earth-S to fight the supervillains that froze it over. Mera and Aquaman fought the Ocean Master, the Icicle, and Captain Cold. 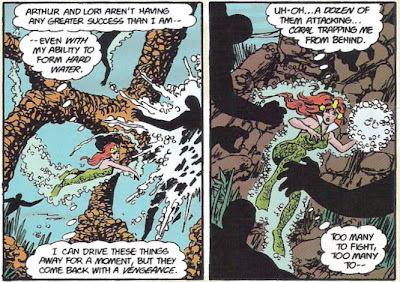 Mera was also in Atlantis when Aqualad brough a very badly hurt Tula A.K.A. Aquagirl, who had been attacked by Chemo in Earth-4. Unfortunately Tula died and Mera was there to deliver the bad news and console a broken Aqualad. When all dimensions were consolidated into a single one, and the final battle started, Mera and her allies were defending the capital city of Poseidonis from the Antimonitor's killer shadows. 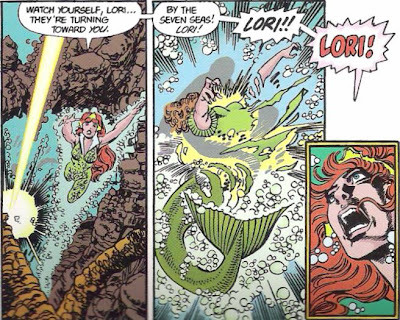 It was here that Mera witnessed the horrifying death of Lori Lemaris, the mermaid who had been at one time Superman's girlfriend. And so tragedy struck. While attacking the Antimonitor's stronghold, Superman and the new Doctor Light got cornered by the powerful villain. Supergirl came to the rescue and destroyed the Antimonitor's armor, but it came at a price... the girl of steel died in the arms of her cousin. Once the heroes returned to Earth-One, a funeral was organized; people around the world said good bye for the last time to the brave superheroine. 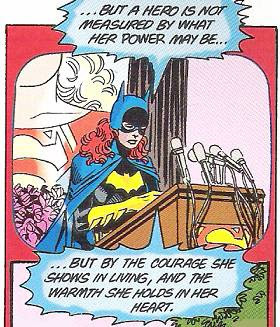 It was her best friend, Batgirl, who gave the eulogy. After this, Supergirl was erased from history; but as if remembering this great loss deep inside her mind and her heart, Barbara eventually gave up her Batgirl mantle and so the damsel from Gotham was no more. Indeed, Crisis on Infinite Earths was a cosmic event as much as it was personal. Crisis on Infinite Earths was the 1986 event that reshaped the DC Universe. Worlds lived, worlds died, and certainly nothing was the same... ever again. It was not just the cosmic catastrophes that led to the crisis, there were also small-scale, more personal crises that threatened with destroying everything the heroes stood for. 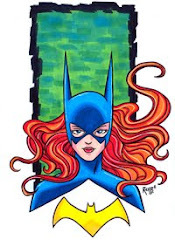 For Batgirl, Crisis on Infinite Earths was the beginning of the end of her career as a caped crusader. Here, Batgirl talks with her friend of years Kara Zor-El, Supergirl. The crisis was becoming too overwhelming for her, and she felt impotent before the cosmic scope of the events taking place; but the Girl of Steel reminded her that everyone can make a difference; she talked to her of the firemen, doctors, and nurses aout there helping everyone... they are heroes too. After telling her this, Kara Zor-El flew off to save more lives. 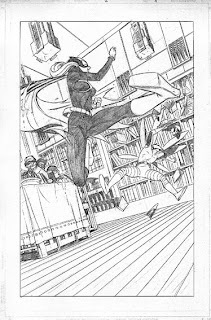 This was the last time Batgirl and Supergirl were together before tragedy struck. In the novelization of "Crisis" this scene takes place early in the story, but an extra piece is added. After the "What have I become?" 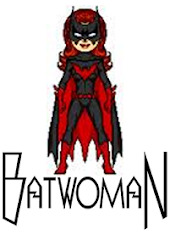 line, there is a car crash in the street below, and without thinking for a second about herself of her safety, Batgirl jumps to the recue. Even though she didn't know it then, she was also a hero... through and through. 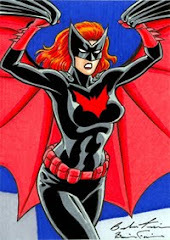 Bruce Timm is responsible for the "modern age" incarnation of the Animated Series style of the DC Universe characters. It all started in 1993 with his "Batman: The Animated Series". 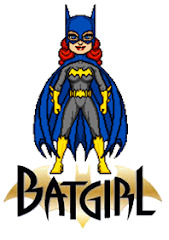 This is a 1995 Batgirl by Bruce Timm himself... she is just perfect! Bruce Timm es responsable por la versión moderna de los personajes del Universo DC en su estilo de las Series Animadas. Todo comenzó en 1993 con "Batman: La Serie Animada". Esta Batichica de 1995 fué dibujada por Bruce Timm mismo... perfecta! 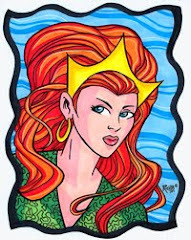 Did you know Mera has a twin sister? Yup, an evil twin sister! 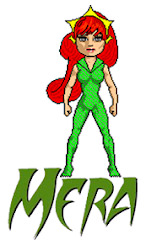 Her name is Hila, and once she came to the Earth dimension to pose as Mera and be... you know... evil. Aquaman #22 was the issue of her first and only apparition; since then, Hila has never been seen or mentioned again... kind of. Remember Fred Hembeck? We did a special on the redheads as drawn by his funny pencils; today, Mr. Hembeck revisits the Aquaman #22 cover featuring the King of the seas and Mera against Hila. Problem is: who is the good sister and who is the evil one? You decide, and while you are at that, also decide: which cover is cooler? Sabian que Mera tiene una hermana gemela? Ajá, una malvada hermana gemela! Su nombre es Hila, y en una ocasión vino a la dimensión de la Tierra para suplantar a Mera y ser... malvada. Aquaman #22 fue la edición de su primera y única aparición; desde entonces, Hila nunca ha sido vista o mencionada de nuevo... casi. Recuerdan a Fred Hembeck? Hicimos un especial de las pelirrojas dibujadas por él; hoy, el señor Hembeck redibuja la portada de Aquaman #22 protagonizando al Rey de los mares y Mera contra Hila. El problema es: quién es la buena hermana y quién es la mala? Ustedes deciden, y mientras lo hacen, también decidan: cual portada es mejor? This is Dakota Fanning as Hawkgirl in the new "Justice League Jrs: The Movie". Kidding! 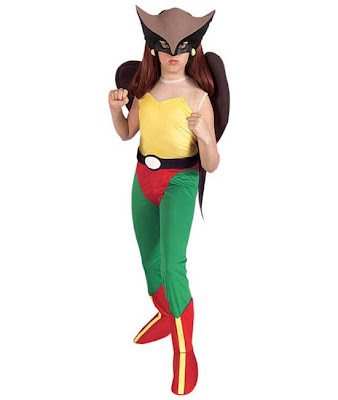 Thanks to the Justice League Animated Series, Hawkgirl became so popular that there is merchandise of her all over the place (we will explore more of this in future posts); this is one example: The Hawkgirl Halloween costume. It is really cute with the helmet and the little wings; I dont know if it includes the redhead wig, or if it belongs to the supermodel below. Anyway... once people start selling costumes of your favorite comic book character, you know he/she is an A-lister! 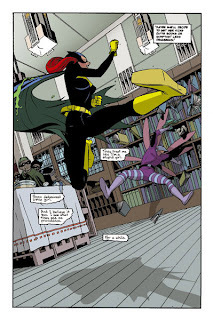 This incredibly dynamic image of Batgirl vs. Killer Moth belongs to the "Batgirl: Year One" story. Today, we present the process of this great piece, from its initial pencils stage, to inks, to colors. Art by Chuck Dixon. What's so great about this page is the angle in which the action is shot; the "camera" is in the place that maximizes the kick to the extreme. Esta increiblemente dinámica imagen de Batichica contra Killer Moth pertenece a la historia "Batichica: Año Uno". Hoy, presentamos el proceso de esta gran pieza, desde su etapa inicial en los lápices, pasando por las tintas, hasta el coloreado. Arte por Chuck Dixon. Lo grandioso de esta página es el ángulo en el que la acción es tomada; la "cámara" está en el lugar que maximiza la patada al extremo. Before I start... PLEASE HAVE AN OPEN MIND and try to see this through the eyes of a fan. "Capture Entertainment is currently working on a live-action/animated fan film for Aquaman. It is an independent non-profit, artistic expression created purely for fun". With that said, here are some scenes of the short film "Aquaman". 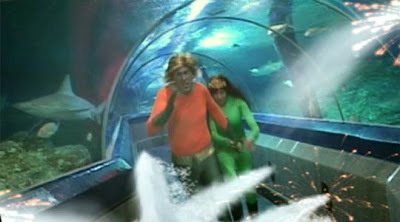 Shooting takes place at Underwater World in Queensland. 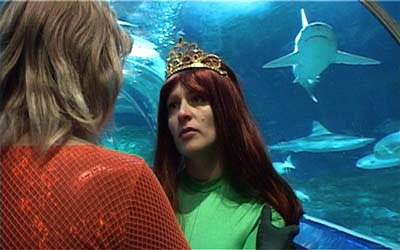 Katriina Johnson is the actress portraying Queen Mera of Atlantis. Antes de comenzar... POR FAVOR TENGAN UNA MENTE ABIERTA y traten de ver esto a través de los ojos de un aficionado. La compañía Capture Entertainment está trabajando en una película de acción/animada de Aquaman. Es una expresión artística independiente, sin ánimo de lucro, creada solamente con propósitos de entretenimiento. Con esto dicho, aquí tienen algunas imágenes del cortometraje "Aquaman". La filmación toma lugar en Underwater World, en Queensland. Katriina Johnson es la actriz que interpreta el papel de la reina Mera de Atlantis. Today, we are introducing a new post banner that will appear along with the already classic daily banner. This one consists of images from the Super Amigos Album by José Luis García López and trademarks in spanish as a reminder that this is a bilingual blog. Hoy introducimos un nuevo banner que aparecerá junto con el ya clásico banner diario. Este banner consiste de imagenes del Album de los Super Amigos por José Luis García López y las marcas registradas en español para no olvidar que este es un blog bilingüe. This great image by none other than José Luis García López is part of the 1988 DC Comics Calendar. It features the women of DC, and two of the redheads are part of the shot: Hawkwoman and Batgirl share the stage with Wonder Woman, Black Canary, Wonder Girl, Zatanna, and Supergirl. When I was a kid, I remember this image coming in a centerfold in one of the old Superman comics in Colombia, and immediately fell in love with it. In the DC Calendar, this picture was featured for the month of December; great way to end the year. Mera out of her element? Think again!